Living and animated worlds have collided before, in encounters typically presented either as a matter of co-existence (Mary Poppins, Who Framed Roger Rabbit?) or of travel between universes (Cool World). In The Congress, writer/director Ari Folman deploys neither approach. Instead, he uses animation as a singular representation of a subjective shared reality whose nature could keep philosophy students properly occupied. Before the film turns into a surreal concoction of visuals, however, its narrative begins in the live-action realm, with a meta-fictional twist whose class and humanity starkly contrasts with another notable meta-fictional fantasia, namely Charlie Kaufman’s crass and heartless Being John Malkovich. In this case, the twist comes from Robin Wright playing an analogue of herself also named Robin Wright and also a charismatic Hollywood figure on account of a breakout role in The Princess Bride. Years have passed since that milestone film. Robin’s career has been sidelined in favour of caring for her children, particularly a son whose life is increasingly affected by visual and auditory impairments. Meanwhile, she exasperates her agent, played with sensitive heft by Harvey Keitel, who has played tolerant witness to damaging career choices borne from fear and insecurity. There is much poignancy to be extracted by what might otherwise be a clichéd scenario, particularly in a scene where Keitel’s agent, in a bid to extract emotion from Robin, delivers a confession that is simultaneously monstrous and heartrending. Yet the narrative takes on greater significance with the layering of an additional dimension to the surface story. On the surface, we are presented with an aging performer confronted with the brute fact of failing to fulfill the shining potential promised by youth. Then entertainment as enacted by technology emerges as a critical theme, embodied by a harsh studio executive who proffers the “last contract” Robin will ever sign. The contract: a one-shot deal that has be taken or abandoned, with the consequences of either choice ineffably etched in ink, regret, or both. Robin’s dilemma: agree to be scanned – body, emotions, mannerism – for the creation of a digital avatar to be used by the studio’s digital puppeteers in the service of future movies. In return for being paid for this technological duplication, Robin is made to agree never to perform again, not even in the local school play. Thus we have the studio’s vision laid out; a stable of infinitely pliable digital actors, without the drama of a real person to interfere with the machinations of the entertainment studios. But that’s only the set up. If Forman had stopped there, he would already have presented a touching character study with a wistfulness not unlike that The Illusionist, animator Sylvain Chomet’s meditation on age and fading professions. He moves on, however, with a narrative inspired by Stanislaw Lem’s The Futorological Concress. Set 20 years into the future, after Robin has signed her acting persona to Miramount Studios, the film turns to animation. A little ampule, recalling Morpheus’ red pill, bonds Robin to the animated Futurist’s Congress, an exhilarating and chaotic gathering of characters whose styles vary from Robert Crumb to Looney Tunes and others still. The significance of the switch from live-action to animation is simple enough to decipher; it depicts alternate perceptions of reality. (That reference to The Matrix wasn’t accidental, although The Congress has its ontology rooted in something more humane than the Waschowski’s pulp-philosophical pretensions.) In that sense, Folman could have chosen any number of means to achieve his end, animation only being one of several options. Yet animation’s ability to indulge imagination without the technical limits of live filming – practical special effects, costuming, set construction, and so on – proves to be an inspired choice. We are dazzled with characters, creatures, and environments that interact as only they can in a world free of chemical laws, where dream-logic is as much in force as formal logic. It’s a mind trip, in which we are challenged to go beyond a critique of Hollywood with questions about technological progress and the societal function of entertainment. As the studios’ obsessions with ever more immersive and direct forms of escapism is taken to a logical extreme, a film that began with one particular actor’s ordeal takes on startlingly universal significance. The resulting speculative fiction, whose interpretation has to be pieced together from the few clues that are offered, is ceaselessly fascinating, even spellbinding. It is also surprisingly bleak, although coming to that realization is moderately cushioned by the warmth of human relationships, however ultimately transitory. Curiously, the film is not oppressively downbeat for all that it stares into the deep, dark abyss of technological dystopia. Rather, it leaves us with a pensive melancholy and the lingering drive to interpret and re-interpret the film’s many facets. 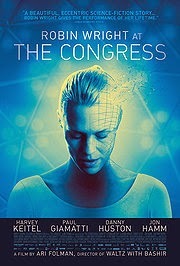 For all that the consensus at Rotten Tomatoes dings The Congress for a messy structure, I view the convolutions as essential to a film that is, at its core, about subjectivity. Lapses in linearity are not a shortcoming but assets in an intelligent and demanding science-fiction film that rewards our engagement, mind and spirit.